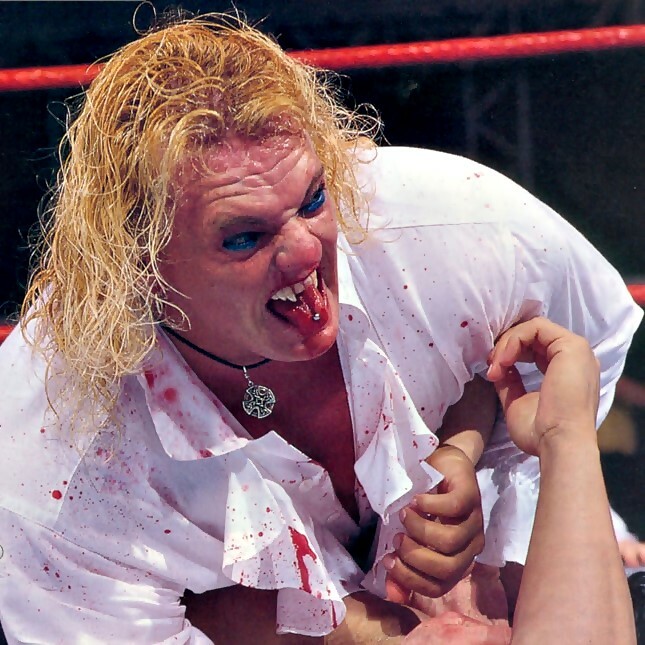 I really can't recall any big time baddie in wrestling that was a standout vampire other than Gangrel, and if there was I'll be sure to write about them later. This guy's whole presentation was perhaps the closet thing anyone could ask for. How the room would get dark and fire would rise to suddenly light it back up, and as they flared at the walkway where he would appear along with his two others, having a goblet in hand filled with blood. He would walk slowly to the squared circle with company, and once in it he would take a slurp and spray it out forming a red mist. The stable was called The Brood, truly a force that most wrestlers dreaded to dealing with. Their feuds started in what I find to be one of the most excitement inducing things ever as the lights was shut off on whatever segment was happening and than red flashes go off as you see three figures jump the victim, and after an extended period of more darkness the lights go back on to the sight of the victim having been given a bloodbath. Gangrel was major enough of a heel to be given a chance at the European Championship title held by X-Pac but to no success, which seem to have brought his power level down because he would than later merge with the strongest heel faction at the time, The Ministry of Darkness lead by The Undertaker, which meant more losses for Gangrel and company. After The Ministry of Darkness was defeated and no more Gangrel would later seek to regain dominance and would turn on his brood members and recruit The Hardy Boyz thus forming The New Brood but this proved to be a mistake for the Hardy Boyz where not to turn heel and would defeat Gangrel. So in terms of story that was the end of Gangrel at boss status for was pretty much at minion level. Years passed for him to come back as a hired goon for JBL but didn't get many wins, as a good villian should. Gangrel outside of the WWE universe was a big deal too, managing to captures many belts, given hall of fame status as a legend. So regardless of not having ever held a belt in WWE, Gangrel is not to be forgotten from history.